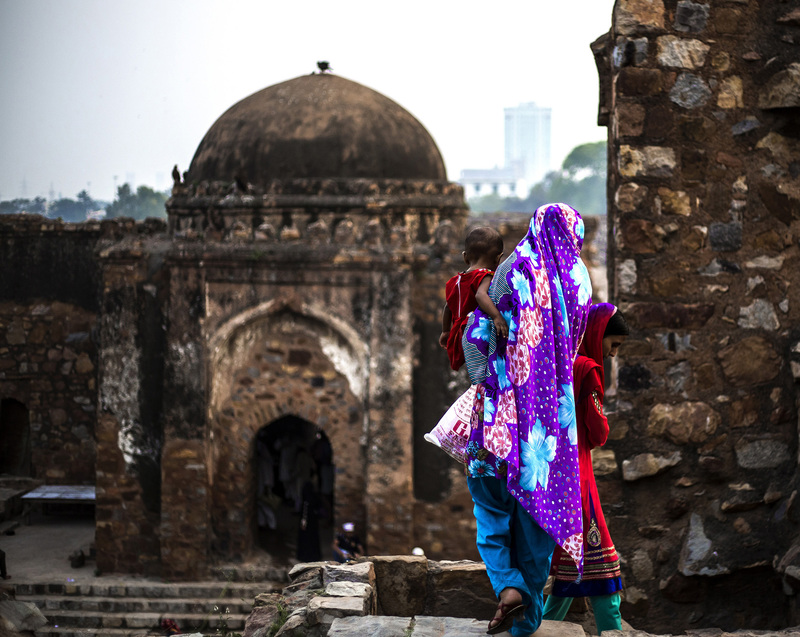 Built by Sultan Feroz Shah Tughlaq in the fourteenth century, the ruins of the fort today rest nestled between a cricket stadium and Delhi’s Ring Road. On a Thursday morning, Noorjahan, a mother of five young children, came to Kotla with photocopies of a letter in her hand. She had written to djinns: about how she and her children kept ill. Her house had been sold off and her children didn’t study. She went around Kotla, sticking photos of her children and the photocopies at different spots and praying to the djinns. Noorjahan’s djinn-worship may remind you of dargahs, but in Kotla the venerated are djinns and not sufi saints or dervishes. Anthropologist Anand Vivek Taneja, an assistant professor of religious studies and anthropology at Vanderbilt University in Nashville, Tennessee, links djinn worship to modern Indian history. “It was only in 1977, a few months after the end of the Emergency, that we have the first record of people starting to come to Firoz Shah Kotla in large numbers. This seems significant, given how destructive the Emergency was for the Old City and how many poor and working class people were displaced from the Old City to resettlement colonies across the river,” Taneja wrote in an article. According to Taneja’s research, the practice of writing to the djinns in Kotla started with renewed vigour in the late 1970s when a fakir named Laddoo Shah came and started living in the ruins. 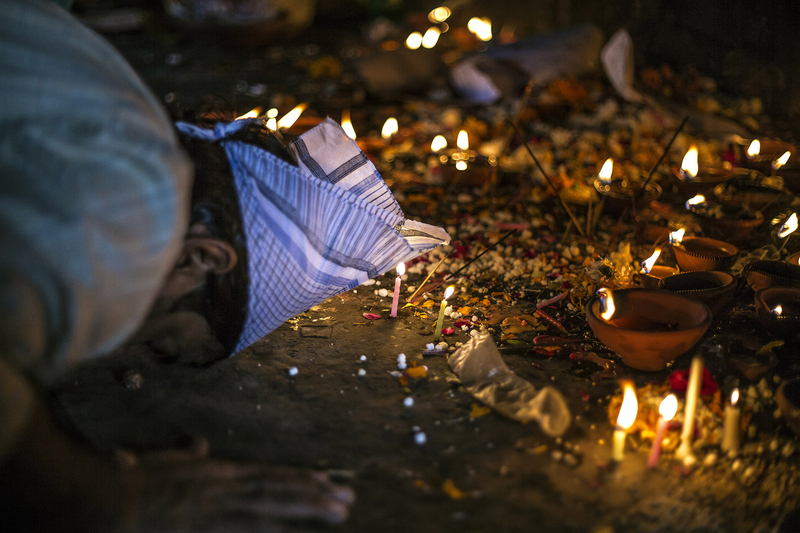 A man kneels down and prays to the djinns. “Anyone can come here for help-there is no preferential treatment, all are equal. People come with all sorts of difficulties and write to the djinns about them. 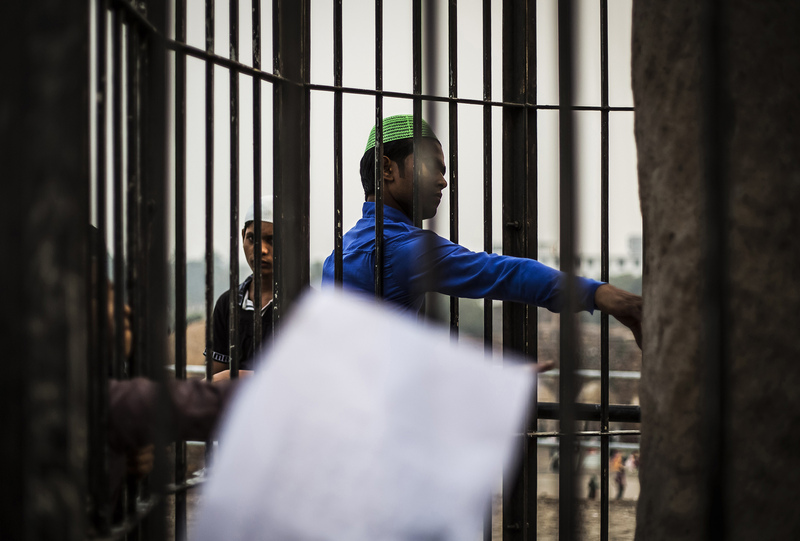 They attach photocopies of the same letters, so that the djinn under whose jurisdiction the particular case falls, can take it up,” says Mohammed Harun, a resident of Old Delhi. “Remember, the government of the djinns, is quite like ours. That’s why you have to make sure that the correct department gets your application, and hence the photocopies,” he says. 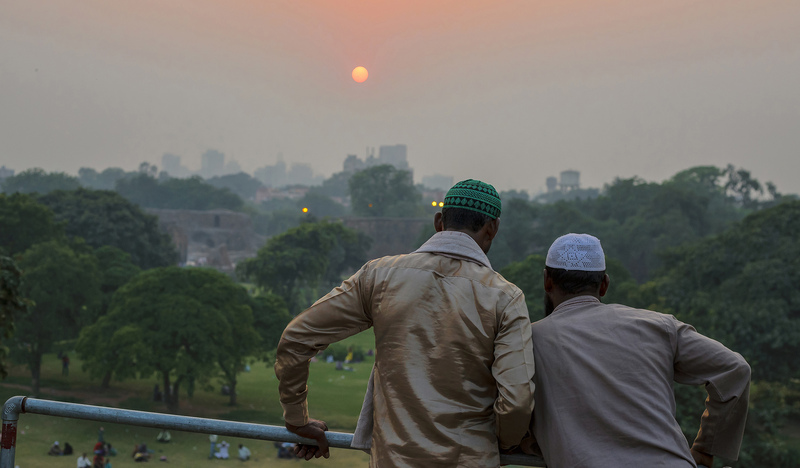 Near the Jami Masjid, a mosque inside Kotla, there is a pyramid-like structure on which stands the Minar-e-Zarreen, a 13.1-metre, highly polished sandstone pillar. It was originally erected by Emperor Ashoka in Ambala in the third century BC and centuries later lifted to Kotla on the orders of Tughlaq. Popular belief goes that Laat (pillar) Waale Baba, the chief of the Kotla djinns, dwells in the Minar-e-Zarreen. Letters written to him are left tied to the railing protecting the pillar. People crane themselves putting a hand through the railing, because they believe that a wish asked for while touching the pillar will be granted. Popular belief goes that Laat (pillar) waale Baba, the chief of the Kotla djinns, dwells in the Minar-e-Zarreen. People crane themselves putting a hand through the railing. Nirmal Pandey, a security guard at the Feroz Shah Kotla ruins for six years, says people’s faith in the djinns amazes him. He recollects the Muslim family from Jaipur he met at the ruins last year for four Thursdays. When Pandey asked the family what brought them every week to Kotla, they said their failing business had recovered and their daughter found a groom after writing letters to the Laat Waale Baba. In return of such grace, they visited the ruins on Thursdays to complete seven cycles of djinn-worshipping. 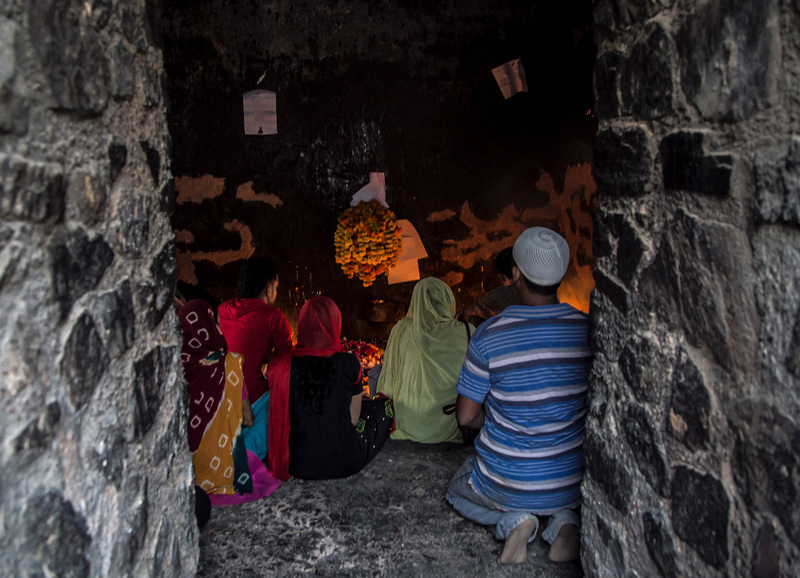 Every Thursday, a huge crowd visits the Feroz Shah Kotla ruins to pay their obeisance to the djinns—they pray, light candles and diyas, and write letters. Taneja, who completed his PhD from Columbia University last year with a dissertation on Nature, History, and the Sacred in the Medieval Ruins of Delhi, says djinn worship in the Kotla ruins is socio-politically important for Indian Muslims.”The theological novelty of djinns emerging as venerated saints in contemporary Delhi cannot be understood without also paying attention to the ways in which the state, haunted by the violence of Partition, continues to erase and deaden Muslim landscapes of memory,” he wrote in an article. Kamar Ahmed would agree. The 60-year-old resident of Shahdara in northeast Delhi comes to Kotla often for quiet afternoons. He has never written to djinns but understands why people have faith in them. “I believe that whenever a section of people are in continued trouble they formulate something or the other to find a way out, and one such thing is this practice of worshipping djinns,” he says. Anthropologist Anand Vivek Taneja, has written extensively on how the understanding of the practice of djinn worship in the Kotla ruins, is socio-politically important, as far as Indian Muslims are concerned.